There is a continuous dialogue between the physical environment and the brain’s functions. 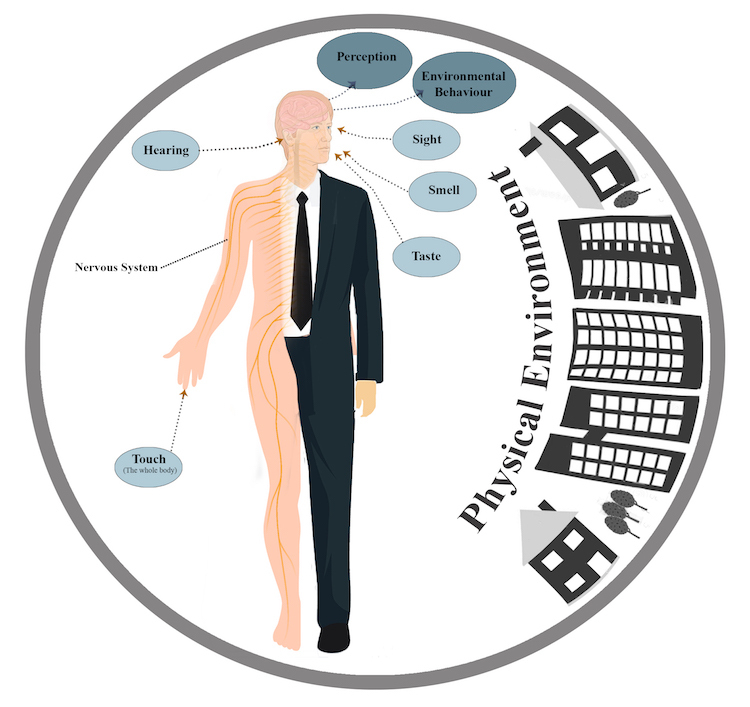 The human constructs the physical environment and subsequently makes physical interventions to it, and this physical environment with its all different attributes affects the way that the human’s brain functions. The brain starts receiving the environmental information, through the five senses, upon its first exposure to a physical environment. Accordingly, the way that the brain responds to the received environmental information determines people’s environmental emotions, perceptions, and behaviour (see Figure 1). These perceptions and behaviour have long been explored in environmental behaviour and psychology studies. Similarly, neuroscientists have studied the brain’s functions and structures in relation to the physical environment. However, spatial designers have paid little attention to the findings of these studies, especially, neuroscientific studies. The spatial design disciplines, namely, architecture, urban design, urban planning, and landscape design, are known as user-centred disciplines. As such, it is important for them to understand how physical environments affect people’s brain’s functions, cognitions, and environmental behaviour. Gaining such knowledge thereby enables spatial designers to design environments which are more responsive to people’s cognitive needs and that can support the brain’s functions. Traditionally, spatial design disciplines have only utilised the research techniques which are common in social sciences, such as surveys and interviews. However, recently some spatial designers and neuroscientists have been working together to develop some alternative research techniques that have some applications for design disciplines. Such collaboration with neurosciences can bring about a number of advantages for design disciplines in studying physical environments. Firstly, applying neuroscientific methods in architecture and urban research can provide a more evidence-based and scientific approach that has previously been unexplored in design disciplines. For instance, an architectural or built environment research, informed by neuroscientific theories and approaches, can look through the neural mechanisms of humans to study how the brain responds to the various attributes of the physical environment. As a result of such a study, designers can learn that what the actual reasons are behind people’s perceptions, moods, and environmental behaviour in the physical environment. Secondly, neuroscientific methods can be used in a complementary manner to test and verify the findings generated from traditional methods used in design disciplines. Therefore, the use of neuroscientific techniques can enhance the reliability and credibility of research in design disciplines. Neuroscience utilises different tools such as, fMRI (functional magnetic resonance imaging) and EEG (electroencephalography) to visualise what is happening inside the brain. Indeed, fMRI is one of the most recently developed forms of neuroimaging which infers the brain’s activities through measuring changes in blood flow within the brain. At present, the use of fMRI is not achievable in spatial research because of its high cost, as well as its particular design which requires participants to lie down in a long narrow tube. The EEG systems, which track and record brainwave patterns using sensors placed on the scalp, are comparatively cheaper. Neuroscience theories suggest that human’s thoughts, emotions, and behaviour are rooted in the communication between neurons within the brain, with brainwaves being produced by synchronised electrical pulses from masses of neurons communicating with each other. These brainwaves can be assumed as a continuous spectrum of consciousness and they are also divided into several bandwidths categories (e.g. Alpha, Beta, Delta, and Theta) to describe their functions. Brainwaves change according to what people are feeling and doing. The recent advent of a Bluetooth version of electroencephalography (EEG) headset have found to be a useful tool for spatial studies, as research participants can wear the EEG headsets and walk within the study area (e.g. an urban area or a building). Subsequent analysis of the brainwaves recorded by an EEG system in spatial studies can determine how people’s moods and mental engagements with an environment change. Cloud Lab at the University of Colombia carried out experiments with participants who wore EEG headsets and walked around Brooklyn, New York City to map the urban areas of ‘mediation’ and ‘attention’ (Deutsch, 2017). The architect, Mark Collins, at Cloud Lab, who is working on how emerging technologies and computing innovations are affecting the city, pointed out that it is very important to get EEG technologies into the hands of architects, so when the cities inevitably change due to technological progress, architects could have a stake in this shift (Goodyear, 2014). There has been small but increasing number of studies that have utilised EEG systems in the study of environment. Aspinall et al. (2015), for example, studied whether green space areas can help people in emotional recovery from stress. They used EEG to investigate how the emotional experience of a group of walkers within three different urban environments change. These areas included a path through green space, an urban shopping street, and a street in a busy commercial district. They discovered that lower frustration and engagement and higher meditation in the brain occurred when participants moved into the green space area. However, the mental engagement increased when research participants moved out of the green space area. The results of their study, therefore, emphasised the important role of urban green spaces as mood-enhancing environments for walking or other forms of physical activities. In March 2017, The University of East London organised the conference ‘Between Data and Senses’, which particularly focused on the collaborative research projects between spatial design disciplines and neurosciences. In this conference, some of the recent research projects using the EEG method in spatial design disciplines were presented. Anastasia Karandinou from The University of East London and Louise Turner from The University of Portsmouth, for example, presented the use of the EEG method in a navigational study. They indicated that the peak of Beta (a category of the brainwave which shows the mental engagement) occurs at the decision points, which refer to the key moments of navigation during a journey. Bridget Snaith and Sven Mundner from the University of East London also presented ongoing research that explores the possibility of using GPS and EEG simultaneously in order to develop a reliable method which could precisely link EEG records with the movements of people. This method would use GPS to track people’s movements along with EEG recording in order to demonstrate the brain’s activities (the brain’s responses to the environment) at specific locations. They explained that GPS tracking and EEG recording can be used in a complementary manner and as a way to provide objective data supporting proposals for spatial or graphic wayfinding interventions in particular locations. Snaith and Mundner’s research was undertaken as a part of a ‘wayfinding’ task for a key housing development within a large-scale regeneration project in South East London. This can, therefore, lay a good foundation in the development of the use of EEG as a method not only in research but also in practice. Still in its infancy, the collaboration between design disciplines and neurosciences have started to find ways in which they can effectively support each other. Neuroscience can enhance design disciplines in developing their scientific methods to discover how people perceive and behave in the physical environment by looking at the neuronal system. The design disciplines can then exploit this knowledge to enhance and improve people’s lives by designing places that support people’s cognition and perception. Design disciplines can take neuroscience findings (e.g. the findings regarding the function of the brain in relation to the physical environment) one step further and realise them in the design and development of places. The outcome of such collaboration can be creating places that maintain the health of the brain (e.g. mental and cognitive health). Moreover, as technology becomes more advanced and data becomes more accessible, then greater engagement can provide more precise datasets through neurological tests. This information can, therefore, help the design disciplines to develop a holistic evaluation system to assess the spatial designs and developments in relation to the brain’s functions. – ASPINALL, P., MAVROS, P., COYNE, R. & ROE, J. (2015). The urban brain: analysing outdoor physical activity w ith mobile EEG. Br J Sports Med, 49, 272-276. – DEUTSCH, R. (2017). Convergence: The Redesign of Design, John Wiley & Sons. – GOODYEAR, S. (2014). The Quest to Measure the Brain’s Response to Urban Design [Online]. CITYLAB. [Accessed 20/10/2017 2017]. – KARANDINOU, A. & TURNER, L. (2017). Architecture and Neuroscience; what can the EEG recording of brain activity reveal about a walk through everyday spaces? In: KARANDINOU, A., ed. Between Data and Senses. London. – SNAITH, B. & MUNDNER, S. (2017). Navigating Thamesmead: Applying Geolocation and EEG recordings of brain activity in Wayfinding Design. In: KARANDINOU, A., ed. Between Data and Senses. London. Negar Ahmadpoor is a PhD candidate at The Department of Architecture and Built Environment, University of Nottingham, UK. Her PhD project focuses on studying the effects of using GPS-based systems on people’s navigation within the built environment and the respective role of place design. She is also a research assistant at The University of East London where she is working on a project examining the use of electroencephalography (EEG) as a method to analyse people’s mental engagement with the architectural design of the Museum of London. Her research interests include studying environmental psychology, applied neuroscience in architecture, cognition of place and human environment interactions in order to integrate them into design to make the built environment predictive and responsive to its users’ needs.